ROYAUME UNI – Stronechrubie - Archaeologists have uncovered the remains of what they believe could be an Bronze Age bathing site, or a sauna. The metre-deep pit with a channel to a nearby stream was discovered at Stronechrubie, Assynt, in the north west Highlands. The project team had been trying to understand what a crescent shaped mound of stones had been created for. Excavations at the mound by archaeologists and volunteers unearthed the pit and channel from beneath a layer of clay. 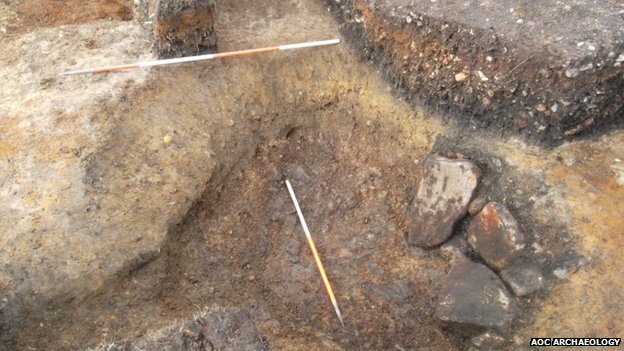 Archaeologists believe it may have been created for bathing, or as a sauna. They said other possible uses for the site included cooking and feasting, or perhaps brewing. Gordon Sleight, projects leader for Historic Assynt, said: "Under a strange layer of clay, we came down to a 1.5 metre square, one metre deep pit dug into the ground with a channel to feed water in from a nearby burn, plus three slabs which may indicate it was once lined with stone. "There were no animal bones or anything to suggest its use as a cooking site and its size would have made it well-nigh impossible to bring to boiling point. "So warm water is more likely, which suggests it was used for bathing, or perhaps as a sauna or sweat lodge." Assynt is peppered with ancient sites, including the ruins of a 2,000-year-old home called a broch. Historic Assynt believe Clachtoll broch was built and occupied by a sophisticated maritime culture stretching up to the Northern Isles and out to the Hebrides at a time before the Roman conquest of southern Britain. The tower may have been seen by ancient Greek geographer Pytheas during his circumnavigation of Britain. CANADA – Yukon River - Some 290 stern-wheelers and steam-tugs once plied the Yukon River, and provided the primary method of transportation during the great Klondike and later Alaska Gold Rushes in the late 19th and early 20th centuries. Many of these vessels were abandoned in remote locations and only two intact vessels survive. TURQUIE – St.Simeon - The Monastery of St. Simeon near Antakya in southern Turkey is one of the world’s most important pilgrimage sites for Christians. Yet Turkey has no official data base of the area’s heritage, leaving valuable sites open to destruction. 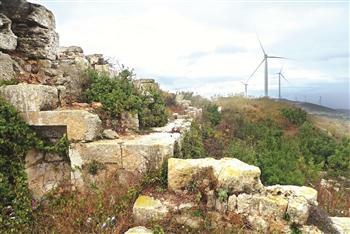 “Recently 23 wind turbines were situated on Samandağı or Simeon Mountain near Antakya – ancient Antioch, now located in present day Turkey to which the hermit Saint Simeon the Younger withdrew from the world,” Nezih Başgelen told Hurriyet Daily News. “One turbine was even placed within the precinct of a monastery that was built there. In a region abounding in suitable mountain tops, this has to be seen as an excellent example of Turkey shooting itself in the foot. The metaphorical foot being a historical site that should be considered a world class heritage site.” In ancient times Samandagi was known as Thaumaston Oros (Mountain of Wonder), and the monastery which grew up around the saint’s hermitage became one of the most important pilgrimage sites for Christians. St. Simeon was born in 521 AD and is called “The Younger” to distinguish him from an earlier Simeon known as “The Elder” who had lived on a mountain further to the east in present day Syria. Both Simeons were Stylites, that is, their hermitages were located on the top of a “stylus” or column. St. Simeon the Younger ascended his column in 551 and remained there until his death in 592. The monastery was built around him to cater to his attendant monks and pilgrim visitors. The monastery complex consists of an octagonal courtyard centered on the column, three churches, a baptistery and other buildings built into a spacious walled enclosure. The lower part of the column with its staircase still stands. To the east of the Octagon are the remains of the basilica church of the Holy Trinity built in 551. South of this is a second church built in 562 to the memory of Simeon’s mother St. Martha. The graves of Simeon and Martha were placed in a small chapel nearby. West of the octagonal courtyard were living quarters for the monks, a hostelry and workshops. Although now it lays mainly in ruins the monastery is still an important site. ALLEMAGNE – Mer Baltique - Alarmed at the looting of historically valuable shipwrecks in the Baltic Sea, German archaeologists have started attaching underwater signs designating them as protected monuments. Hobby divers and trophy hunters are damaging a precious maritime legacy stretching back thousands of years, they warn. The two-man U-boat was discovered lying at a depth of 18 meters near Boltenhagen off Germany's Baltic Sea coast in 2000. Its plexiglass turret hatch was intact and closed, which prompted authorities to designate it as a war grave because the crew of the vessel, of a type used by the German navy towards the end of World War II to evade Allied sonar detection and sink ships, was believed to still be inside. Then someone dived down and removed the hatch in 2002. The local government responded by sealing the gap with a steel plate. But there have since been attempts to break it open. The U-boat is one of some 1,500 marine monuments strewn across the seabed along the coast. The area has a wealth of well-preserved shipwrecks, lost cargo, planes and even ancient settlements submerged through subsidence and rising water levels.It amounts to a precious historical legacy and gives insight, for example, into boat-building techniques dating back to the Middle Ages and the events that led to the sinkings. USA - Santa Cruz River - Archaeologists began digging along the Santa Cruz River banks last week in preparation for a Pima County construction project. The Paseo De Las Iglesias is a bank protection project that will feature a parkway and ecosystem restoration. But before construction on the project can begin in 2013 the county must first have the site evaluated by archaeologists. So far Desert Archeology has found evidence of prehistoric occupation in what's being described as a Hohokam village. Mike Lindeman from Desert Archaeology said, "what we did at this site and all the other sites is walk along and count numbers of artifacts on the surface. And we found an awful lot." Dale Slechta, a private citizen, says he found pottery in the area more than a year ago, "there is a history of people living along the bank of this river." Slechta contacted the Tohono O'odham Nation and received a letter expressing thanks for his "locating and returning the prehistoric cremation ceramic vessel that contains the remains of an individual that was laid to rest many centuries ago." Lindeman said any findings would have to be excavated or depending on the site in question the project may have to be built around the particular area. He expects his team to survey the area for the next two months. The project is bond funded and is expected to begin in 2013. 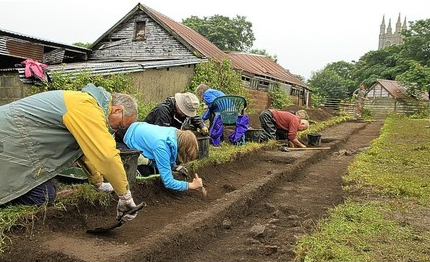 ROYAUME UNI – Widecombe in the Moor - A Dartmoor community got together to uncover the remains of a ruined medieval manor and found evidence that its occupants once travelled as far as Moorish Spain. More than 50 volunteers gathered in a bid to reveal the lost manor of North Hall in Widecombe-in-the-Moor. Archaeologists found the site was robbed for building stone after being abandoned, hastening its demise. They think the stone was collected from the manor site in order to re-build Widecombe Church Tower in the 1640s. Interestingly, they also came across a small piece of "high-status" 15th century pottery from Islamic Spain, indicating that the site might once have been home to wealthy and well-connected people. MAROC - Yakour plain - Stone carvings in Morocco's High Atlas mountains dating back more than 8,000 years and depicting the sun as a pagan divinity have been destroyed by Salafists, a local rights group said on Wednesday. "These stone carvings of the sun are more than 8,000 years old. They were destroyed several days ago," Aboubakr Anghir, a member of the Amazigh (Berber) League for Human Rights, told AFP. "One of the carvings, called 'the plaque of the sun,' predates the arrival of the Phoenicians in Morocco," Anghir said. "It lies in a well-known archaeological site in the Yakour plain south of Marrakesh, 20 kilometres (12 miles) from Mount Toubkal." BULGARIE – Sofia - Archaeologists have discovered colorful floor mosaic from the Roman era near the so-called West Gate of Serdica in downtown Sofia. The mosaic has an area of 40 square meters and is located in the ruins of a Roman building discovered for the first time between 1975 and 1980 when archaeologists began exploring the site. The works were later abandoned and remained unfinished. Serdica's West Wall followed the current "Washington" and "Lavelle" streets to the Central Court building. Fragments of it can be seen in the yard of the largest catholic cathedral in Bulgaria "Saint Joseph." Fandakova said there is likelihood the mosaic is part of a large basilica, which continues under "Washington" street, adding it means archaeologists are to continue their work there to fully uncover "the wealth of Sofia." "The basilica shows the standing of Serdica during the rule of Roman Emperor Constantine the Great (274-337)," the Mayor concluded.